A big thank you to the fantastic Rosehill Readers for organising the march today, they did a great job! I’m James Hargrave and live in Stradbroke and have been part of the campaign to save the library in our village. Back before Christmas there was a deal on the table between Stradbroke Parish Council and Suffolk County Council. The County Council would give the Courthouse building to the Parish and the Parish Council would contribute around £900 a year towards running the library. That was the agreed deal. This would have meant increasing the parish council element of the Council Tax - effectively “double taxation” but Stradbroke would still have a library and it would be affordable. 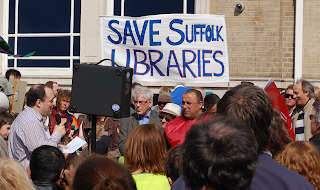 All that changed on 18th January when Suffolk County Council produced their so-called consultation document that listed 29 libraries that would be closed unless they could be, in Suffolk County Council’s Orwellian language “divested”. Stradbroke was on the list and after many enquiries from the Chair of the Parish Council it was evident that SCC has reneged on the agreement. Subsequently Roger McMaster, Head of Suffolk libraries (who has since resigned) ended up apologising to the Parish Council in front of a packed meeting room with hundreds of Stradbroke residents for - HIS WORDS- “misleading” the parish. The full extent of the situation became clear. Suffolk would still give the building (and all its bills) to the parish and would pay for the IT and books. The parish would “only” have to pay staffing and other costs of some £17 000 to £20 000 a year. The whole council’s budget is only £24 000!! Then a group of Stradbroke residents became aware of the “National Day of Action” for libraries on Saturday 5th February and we realised nearly 500 libraries across the UK were at risk. We met in a pub and planned a day of action, set up websites, Facebook groups, Twitter accounts and printed good old fashioned leaflets and then we turned up on the day with no idea how many people would be there. The response was amazing and an estimated 250 people turned up to pack the tiny library and be the first of over 750 signatures we got on our petition. This 60% of the 1250 residents of Stradbroke. On this day we made two videos that you can still see on our website at http://www.stradbroke.org.uk one video was asking simply why the residents came along and why they wanted to save their library. It is an incredibly powerful and moving film.. Ordinary people talking about why they love and rely on their library. The other video is also very powerful but for different reasons! It is a video of myself and the Chair of Stradbroke Parish Council talking to our local County Councillor Guy McGregor who is a member of Suffolk County Council’s cabinet and voted for the cuts. He didn’t want to speak to me and had no real answers to how the library could be kept open and where the money would come from. So we pressed on and held a big public meeting to which Guy McGregor and Roger McMaster were invited. The Community centre was packed and we showed the video of residents speaking at the start of the meeting, The mood of the meeting was clear. Stradbroke residents wanted to keep their library and everyone present thought Suffolk County Council should fund it. Finally, I would like to comment on the concept of the ‘Big Society’. I call this an absolute insult. Villages, towns and cities all over England are more that capable of being a big society. We have been doing it for centuries…we do not need any lectures from the Government or Suffolk County Council about the big society. It happens here every day, every week and every year. What the people of Stradbroke, and everyone here wants from Suffolk County Council is for them to listen to the thousands of people who have signed petitions and gone on marches to fill the “gaps” of their flawed consultation. We don’t want our intelligence insulted by claims to be empowering communities and “doing things differently” when in the real world on the ground these are fancy words for cutting services and closing libraries. We want Suffolk to remove the threat of closure and to continue to fund the library service that is a lifeline to many and part of what makes for, never mind a big society, but a civilised society!